The month of May we were proud to feature Yakima Trap Neuter Return. 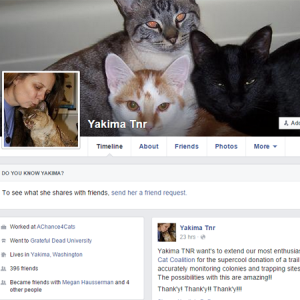 Yakima TNR is a small organization in rural Washington about 2 1/2 hours outside of Seattle. Their focus in on helping control feral cat populations in the Yakima area. They work to humanely capture feral cats, spay or neuter them, give them veterinary care, and the return them either to the wild where volunteers care for them, or to farms and warehouses where the cats control rodent populations. 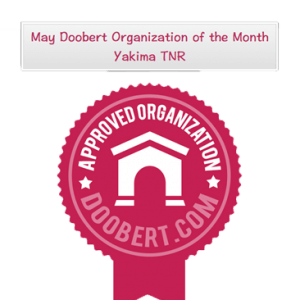 Doobert is proud to select Yakima TNR as the May organization of the month. Yakima TNR is a great example of a small organization having a large, positive impact on their community as they educate the public regarding the value of the feral cat population. Most of their donations come from their own pockets or those of their volunteers so please consider supporting them for the great work that they do. YouTube Video #4 – What do you like about Doobert.com?